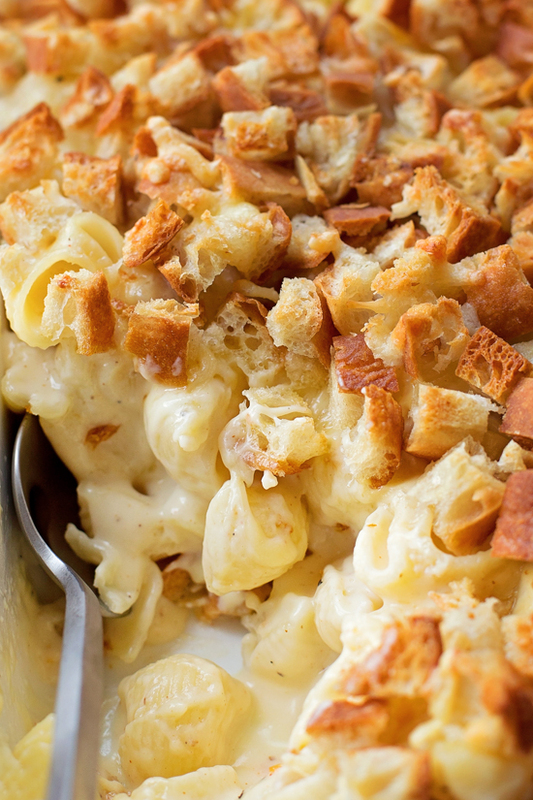 This outrageous macaroni and cheese is creamy, gooey and topped with giant bread crumbs. Making your own has never been easier! I kind of have a thing for macaroni and cheese. But I’m also really picky about it too. It has to be made with REAL cheese and it can’t be greasy. Tell me I’m not alone. That said, I always get a little nervous when I make a new recipe, because I already have a few tried & true ones that I really love. I’m happy to report this one was a big huge hit with both me and my family. My husband said it’s one of the best I’ve made!! ???????? So of course I had to share it with you all! 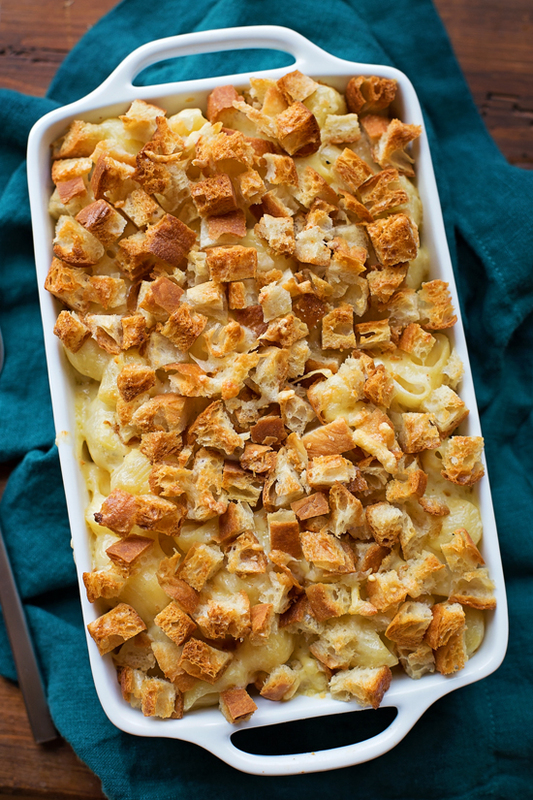 This version is made with a blend of three types of cheese, however, unlike most traditional mac and cheese recipes, it’s not made with cheddar. Trust me, I was a little skeptical about that too, but since it’s loaded with havarti, gouda and pecorino romano, I knew it’d still be delicious- and it was! You’ll start by boiling your macaroni. I chose a medium shell, however, any shape will do (although I’d avoid longer noodles). 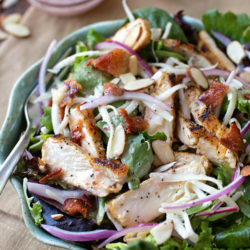 Once it’s cooked, drain it, rinse it, and set it aside in a bowl. Next you’ll need to prepare the bread topping. I used a artisan bread, but plain white bread will work too (or see my notes if you prefer using panko breadcrumbs). Place the bread in a medium bowl. In a small saucepan set over medium heat, melt 2 tablespoons of the butter. 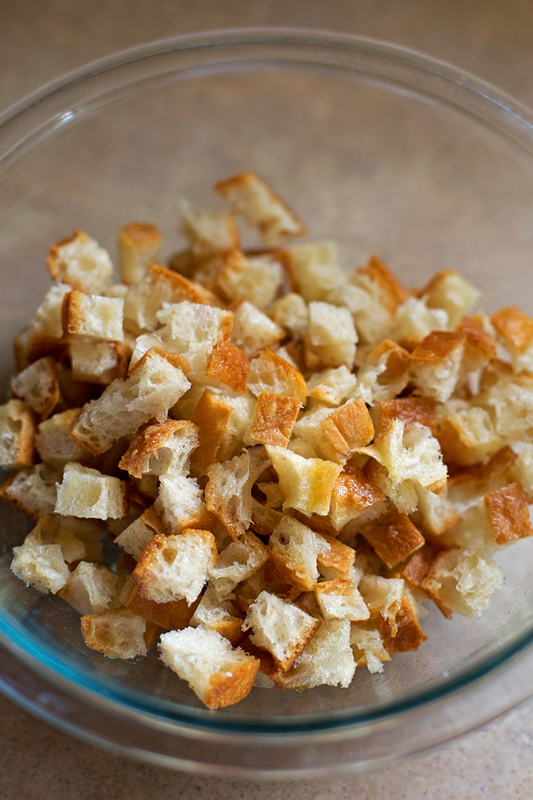 Pour the melted butter into the bowl with the bread, and toss until the bread is coated, then set it aside. Then, in a large stock pot or dutch oven set over medium-low heat, add the remaining butter. When the butter has melted, add the flour and cook, whisking continuously for 1 minute, taking care not to burn. While whisking, slowly pour in 2 3/4 cups of the warm milk, a little at a time so that the mixture stays nice and smooth. Continue cooking, whisking constantly, until the mixture bubbles and becomes thick, about 8-10 minutes. Remove the pan from the heat. Stir in the salt, dry mustard, nutmeg, black pepper, paprika, cayenne pepper, and 1 3/4 cups havarti, 3/4 cups gouda and 2 tablespoons pecorino romano. 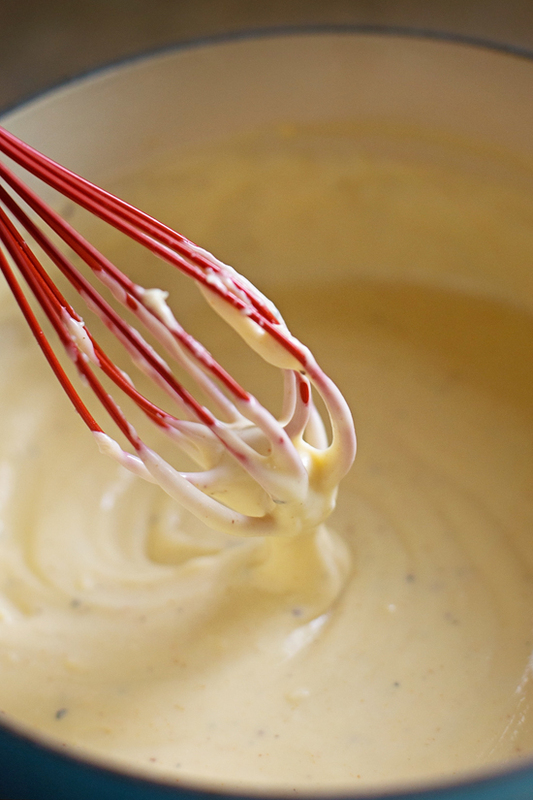 Vigorously whisk until the sauce is smooth, then stir in the remaining 1/4 cup of milk. Pour in the cooked macaroni and toss to combine. Side note: make sure your macaroni is nice and dry. I like to pour it into a colander and set it aside so that it can drip/dry while I made the sauce. Transfer the mixture to the prepared dish. Sprinkle the remaining cheese and the breadcrumbs over the top. Place in the oven and bake until golden brown, about 20-25 minutes or until the breadcrumbs are nice and golden brown. Remove from the oven and allow to cool for 10 minutes before serving. Allowing the dish to cool will help the sauce set a bit. 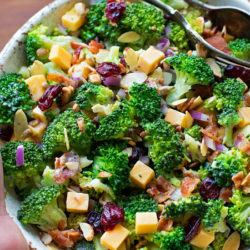 Next time you’re on the hunt for a delicious, cheesy side dish, give this one a try! Preheat oven to 375°F. 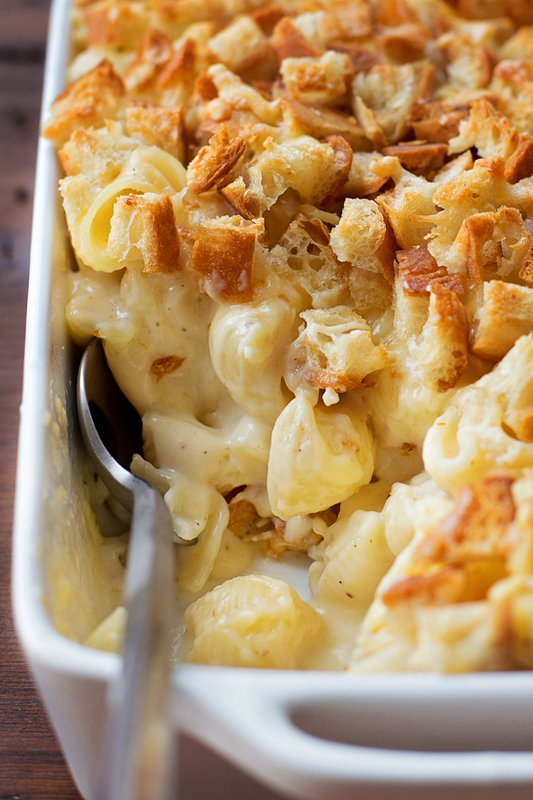 Lightly butter a 1½ quart casserole dish or an 8x8-inch pan; set aside. 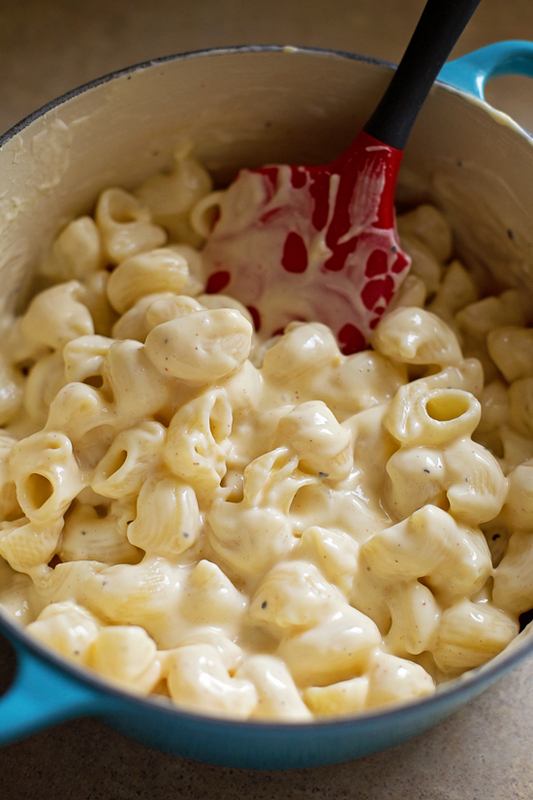 In a large stock pot or dutch oven, cook macaroni according to package's instructions. Drain, rinse and set aside in a bowl. Place the bread in a medium bowl. In a small saucepan set over medium heat, melt 2 tablespoons of the butter. Pour the melted butter into the bowl with the bread, and toss until the bread is coated; set aside. In a large stock pot or dutch oven set over medium-low heat, add the remaining butter. When the butter has melted, add the flour and cook, whisking continuously for 1 minute, taking care not to burn. While whisking, slowly pour in 2¾ cups of the warm milk, a little at a time so that the mixture stays nice and smooth. Continue cooking, whisking constantly, until the mixture bubbles and becomes thick, about 8-10 minutes. Remove the pan from the heat. Stir in the salt, mustard, nutmeg, black pepper, paprika, cayenne pepper, and 1¾ cups havarti, ¾ cups gouda and 2 tablespoons pecorino romano. Vigorously whisk until the sauce is smooth, then stir in the remaining ¼ cup of milk, then pour in the macaroni and toss to combine. Transfer the mixture into the prepared dish. Sprinkle the remaining cheese and the breadcrumbs over the top. Place in the oven and bake until golden brown, about 20-25 minutes or until the breadcrumbs are nice and golden brown. Remove from the oven and allow to cool for 10 minutes before serving. *Instead of the large bread crumbs, you can also make fine ones by pulsing in a food processor for a few seconds or use panko. 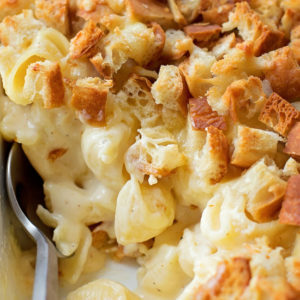 You will add them to the mac and cheese just like the large ones, only you'll want to cover the macaroni with foil for half of the baking time to prevent them over-browning or burning. 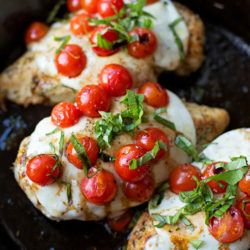 -You can easily double this recipe and bake it in a 9x13-inch dish. Wondering, could you mix this ahead of time, refrigerate and bake later? Definitely! You’ll want to bake it with foil over the top for about 10 minutes and then continue baking it uncovered for the stated time. I have been on the search for the best mac & cheese for over a year now. Yours has been the best so far. My whole family loved it and couldn’t stop eating it. I used the panko bread crumbs. I generally melt 3 tablespoons of butter in a skillet over medium heat, then add 1 cup of panko and toast until lightly golden brown.